Ace 250 Metal Detector is an well designed metal detector that conveniently serves its purpose to ensure great results for its user. It has some nice features that assist any treasure hunter in their endeavors. The metal detector spots a more focused search field than detectors with round coils giving one excellent value. Unlike other metal detectors the Ace 250 Metal Detector has an easy to read and comprehend screen that the user can interact with. Here below we are going to discuss some of those features that make the Ace 250 so great and have earned the metal detector a top spot with other relevant metal detectors. Why Is This Metal Detector a Good Choice? By Garret because it has a distinct ring and fade out time. Relic hunters or a hunter doing a blanket scan over a piece of land might not find it as useful, however coin shooters will appreciate hearing the extra confirmation. The metal detector also has eight levels of sensitivity, five different discrimination patterns and five fully custom notching. This gives the hunter complete control over how the detector reacts to different metals. Advanced in detection– The metal detector is convenient and it will prove beneficial to the hunter as it can easily identify metal from trash. In case the hunter gets over trash mixed with metal the detector will spot the metal and hone in on the testing coin every time. This is can be confirmed on the screen that is well designed and easy to read. Depth detector – Hunters will find the Garret Ace 250 metal detector extremely useful. No hunter would wish to dig for metal not knowing how deep they will dig until they reach the metal. The depth indicator that comes with the metal detector proves useful by assisting the hunters in knowing how deep they will have to dig until they get to the target. The screen has graphic target ID lines at the top with thick, clear hash marks that are perfect for quick glances. A depth indicator on the left hand side accurately gives feedback of how deep the target is. It detects metal materials up to 8 inches deep. The metal detector is easy to use by any hunter looking to detect any metal material beneath the ground surface. Veterans looking for easy metal detectors that are convenient with efficient results and relevantly cheap should consider the Garret Ace 250 metal detector. It’s cheap and offers excellent metal detection services. This metal detector offers similar services as other expensive highly classed detectors. It might have some disadvantages but the advantages overshadow the down sides. The hunter can easily go about their hunting with reassurance that their collection will be fruitful not having incurred miscellaneous costs that come with purchasing the high end metal detectors. Compared to other detectors, the Ace 250 is small and has a shaft that can easily be adjusted as it extends more than enough to comfortably fit a tall adult. It has a thin search coil and compact control box that give it a tight, capable feel. It weighs 2.7 pounds enhancing a comfortable grip and armrest as compared to other metal detectors used by most metal hunters. Topping up to the above explained features the Ace 250 Metal Detector has other extra features that make it stand out if it is to be compared with other metal detectors. The metal detector has a long life battery that goes up to 30 hours without draining. This ensures the hunter is in the field for long hours without having to worry of low battery as is the case with other hunters using other metal detectors. The fourth bell tone makes it possible for coin shooters to collect coins which might not be possible if they use metal detectors that cannot detect smaller metallic objects. Few clients have reported any disadvantages of using the Ace 250 metal detector. The gadget can however be adjusted for efficient results. 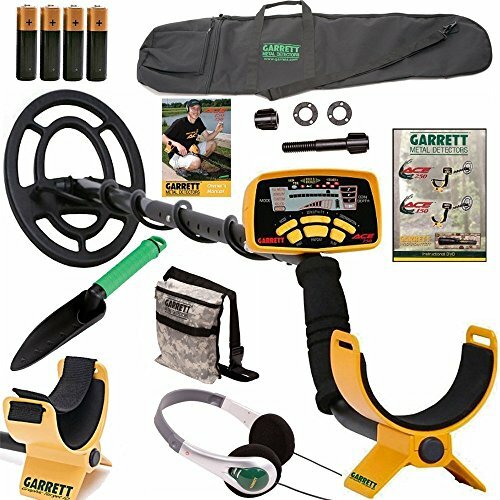 Apart from this, the Garret Ace 250 Metal detector is efficient and delivers unlike other metal detectors. Most metal collectors whether beginners or veterans will find this extremely useful; as it has all the features a metal detector should have at an affordable price.